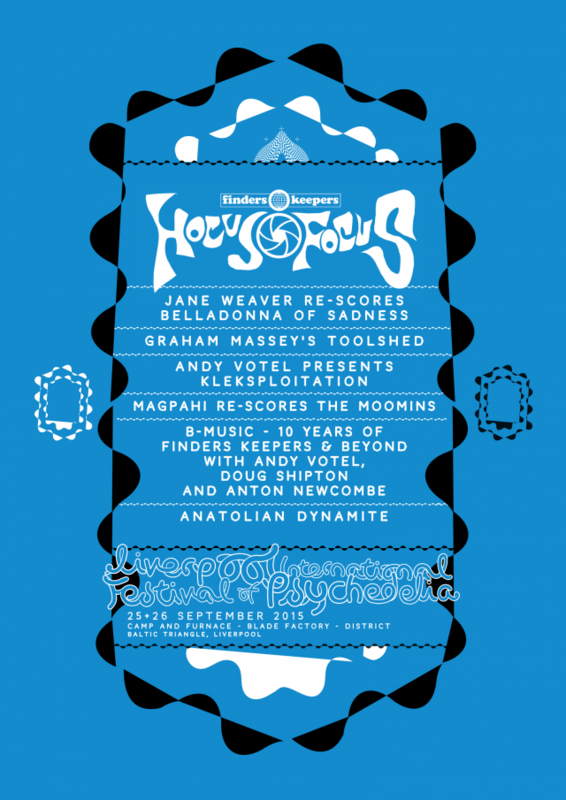 As long-running bedfellows in the seedy boudoir of Northern psych and cosmic pop, ourselves and FINDERS KEEPERS RECORDS will be further indulging our Mancy-Scouse unison to bring you a special series of outer-national audio visual treats at Liverpool Psych Fest 2015. HOCUS FOCUS will act as an exclusive showcase stage of artists, film and bespoke visuals, while simultaneously celebrating 10 years of Finders Keepers’ acidik archival activities in the same sitting. Following on from Andy Votel’s eight-hour Turkish-only Anatolian Dynamite DJ set from 2014, and the Finders Keepers heavy psych sound-system combustion event from 2013, the self professed “Accidental World Music Label” brings another pile of foreign fuzz and lost kosmische tomes to tower over the turntables of this year’s festival. But impossibly rare wax isn’t the only thing label founders Doug Shipton and Andy Votel have up there sleeves this year: 2015’s Hocus Focus residence will feature a programme of live activities influenced by the label’s deep vault of psychedelic filmic material including exclusive live re-score performances from Silver Globalist JANE WEAVER, GRAHAM “808 state” MASSEY and his arkhestral Toolshed project, magik volk esper MAGPAHI, and a well-travelled collaborative project between Andy Votel and polish soundtracker ANDRZEJ KORZYNSKI. Widely respected as one of the most obsessive and prolific re-issue archives of foreign language psych on the planet, fans of Finders Keepers know that their musical good taste also spreads into the realms of cinema, graphic design and live performance and this year at Liverpool Psych Fest the label combines all of these elements to bring you an epic mutant magazine documenting 40 years of experimental noise for the eyes and ears. Japanese/French witchcraft cartoons will share screen space with Finnish/Polish animation, while space-age Polish TV sounds are recycled and regurgitated on a stage full of vintage synths, daisy-chained fuzz-pedals, heavy drums and homemade instruments. From the label that introduced you to the likes of Jean-Claude Vannier, Selda, Yamasuki and endless reels of vintage Lollywood funk and Thai proto-punk, this year’s Hocus Focus stage brings together some of the label’s best experiMENTAL multi-taskers for a night of unrivalled filmic fuzz and celluloid psych.